Pau means finished. I finished two more of my landscape paintings. More trees. Patrons tell me they like the way I paint them. 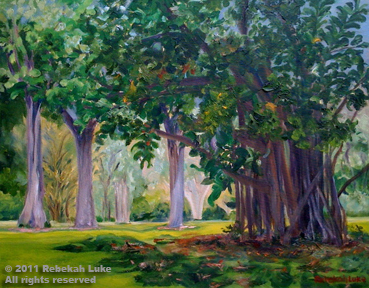 “Banyan Shade” needs a final varnishing as soon as it’s bone dry. “Welcome Spring” is framed, wired, and ready to leave the studio. 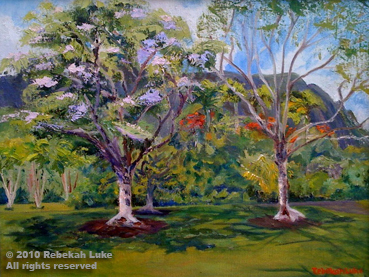 Please click on the PAINTINGS menu tab for other available art work. Thanks for visiting! Very well, thank you! I snapped these photos today. We’re blessed with sunshine and rain year ’round. Flowers, herbs, vegetables, fruit and foliage. You can tell how healthy people are by looking at their gardens. Not just their physical health, but their mental, spiritual, and emotional health too. If they’re flourishing, maikai (good)! If they are weedy, drying, or less neat, then perhaps something is out of balance. * Whenever I pay attention to my garden and take care of the aina (land), my family is rewarded with an abundance of food and beauty. Tending my garden is a way I meditate. My family is committed to growing some food, eating healthier, and living well. This year we invested in good soil mix, planter boxes, bird netting, a worm farm, and natural slug repellent. The late summer months into September have yielded a small but satisfying crop by the studio. We were blessed with Manoa lettuce, bok choy, long squash, sweet potato, papaya, mango, avocado, noni, basil, garlic chives, rosemary, olena (turmeric), calamondin, mint, dill and cilantro. To Native Hawaiians, the aina includes the sea. One recent morning while walking along Kaaawa beach, I saw this bounty of freshly caught octopus hanging out to dry. Wow! * Reiki can be a powerful way to bring things back into balance. Click on REIKI HEALING BY OELEN on the menu bar for more information.